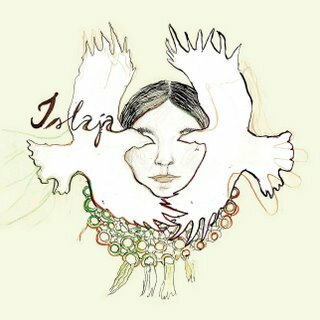 First let me start out by saying this is the first of a two part post covering the past two releases by Finnish musician Islaja. Islaja is Merja Kokkonen, a musician living and working in Helsinki, Finland. Her music lives in a world of elements, of birds, mountains, the sea, and waves, and she cries out in her native language, some of the most transcendental vocals I’ve heard in a while. Her music creates a cove, a safe haven, in which to watch the storm go by. Recorded at home with a wide array of instruments, the music of Islaja is stunning to say the least. Her debut album Meritie (Fonal, 2004) has blown me away with it’s heart-rending sounds. The harmony she creates alone is worth the ride, but the instrumentation here is sparse and subtle, but in a way that only enhances the experience. Below are three amazing tracks from Meritie with links to purchase. She puts her whole being in this work and it shows. Highly recommended!